The staff at SeniorCare Homes is specially trained to assist residents suffering from all forms of dementia and memory loss. We’ve developed an innovative memory care philosophy to enhance the lives of all our residents by making each day meaningful, fulfilling, and endowed with familiarity and a deep sense of belonging. Each of our residences is limited to 5 to 8 people. This enables us to provide the most individualized care, focusing on memory related activities that stimulate the brain and encourage independence and participation in daily life around the house. The first thing that gets taken away when someone goes to a large facility is the ability to cook, clean, set the table, or get a drink-things a person has done their entire life. The real home setting at SeniorCare Homes enables residents to feel relevant, stay engaged, and have assistance when they need it. Life can become very difficult in the final stages of dementia. 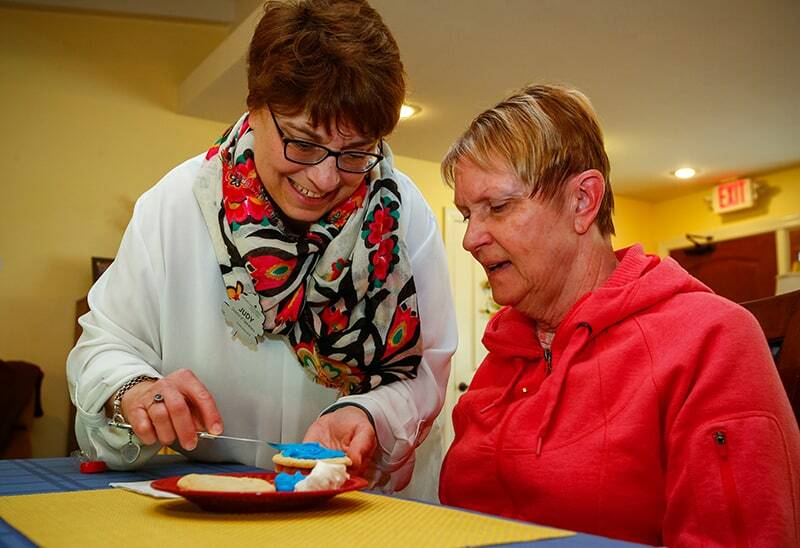 SeniorCare Homes is equipped to deal with all stages of dementia and memory loss while ensuring that individuals continue to feel a sense of belonging and purpose both physically and mentally. There’s nothing more difficult for family members than to move their loved one from a warm, familiar environment where they’re surrounded by recognizable caregivers to a cold, frightening hospital setting when the end of life is near. Person exhibits minimal memory loss. As the condition progresses, forgetting familiar names, words, and other daily objects becomes common. Basic tasks such as driving, cooking, and gardening may become challenging. Person exhibits several symptoms related to memory loss including the inability to remember names. Mood swings, irritability, and personality changes are common. Person has problems recognizing common objects, places, and cannot remember things from the past, or remember his or her own address or phone number. Cognitive abilities are severely affected. Person will have substantial changes in personality and may even lose track of where they were yesterday. The sleeping/waking cycle may shift. There will be increased occurrences of incontinence. Person may become suspicious, repetitive, and easily disoriented. Person is unable to take care of him or herself and requires constant care. The ability to recognize common items such as utensils or shoes is diminished. Person typically requires assistance in bathing, toileting, and getting dressed. Person experiences difficulty with mobility, and may begin to lose the ability to communicate or swallow. Behavior may show agitation, anxiety, or paranoia.